Do you have a problem with your dog? Does your dog have a problem socializing with other dogs or dealing with humans? Lestre Zapanta, known as The Pinoy Dog Whisperer, conducts training seminars with dog owners and their pets where he shares his expertise on dog behavior, responsible pet ownership, and dog training. 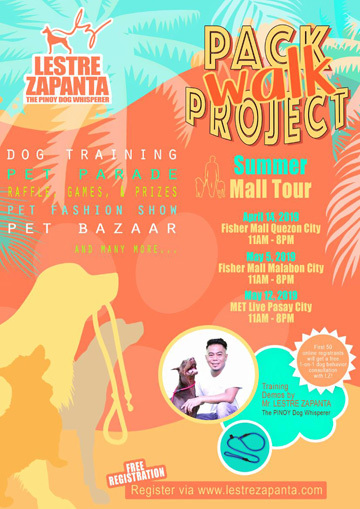 Today (April 14), Zapanta will discuss dog behavior and train a dog on the spot during the first leg of the mall tour of The Pack Walk Project at the Fishermall, Quezon Avenue, Quezon City. The event will be from 11 a.m. to 8 p.m. In the past years, The Pack Walk Project organized by Zapanta has been encouraging dog owners to train with their dogs. Zapanta, an event speaker, and TV/radio host, recently went to Asia and America to film with Cesar Millan, The Dog Whisperer. Millan described Zapanta as having “first class” and “masterful” dog training skills. With over 223,000 followers on social media, Zapanta reaches the dog-owning community in the Philippines and even kababayans abroad. He also creates valuable content through photos and videos that attract interest, engagement, and repeat visits. Lestre & his pets have appeared in many TV and film productions - commercials like Compañero Brandy; TV series like Encantadia, Kalye Wars, & Pepito Manaloto; and various features in Jessica Soho, Front Row, & Brigada. His pets have been cast in films with Ms. Nora Aunor, Ms. Janice de Belen, and other celebrities. This summer, The Pack Walk project started by Zapanta will be a mall tour that focuses on rabies prevention and dog training as part of responsible pet ownership. The program will consist of talks and seminars by canine health and behavior experts, related government agencies, animal welfare advocates, and other special guests; a pet parade and fashion show; and lots of raffle games and contests. There will also be a pet bazaar throughout the day. The highlight of the whole-day event will be the training and demo of Zapanta where he will tame unruly dogs on the spot. Registration and training are free. But please bring the vaccination card of your pet. Sign up via http://www.lestrezapanta.com/register for the other upcoming events.